On June 19th I was in the Carberry-Brandon area of Manitoba and had a free evening. I had seen some photos from a location just east of Rivers (the namesake of the CN Rivers subdivision) and I wanted to check it out. Little did I know how many rainbows I'd encounter around Rivers! Warning! This is going to be a long post, and very picture heavy. Let's go. 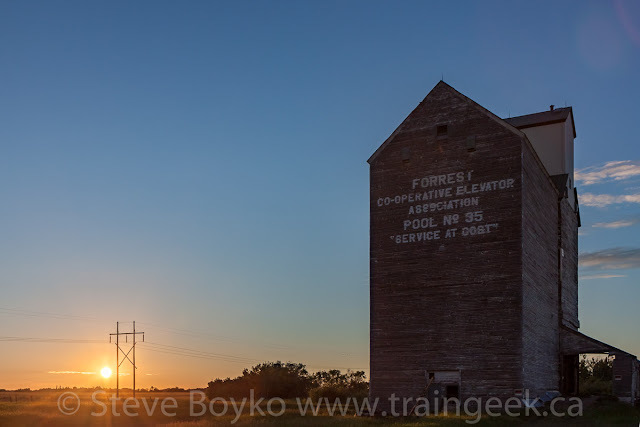 From Brandon, I headed north on highway 10 past the old grain elevator at Forrest, under the CN main line, and then turned west on highway 25. 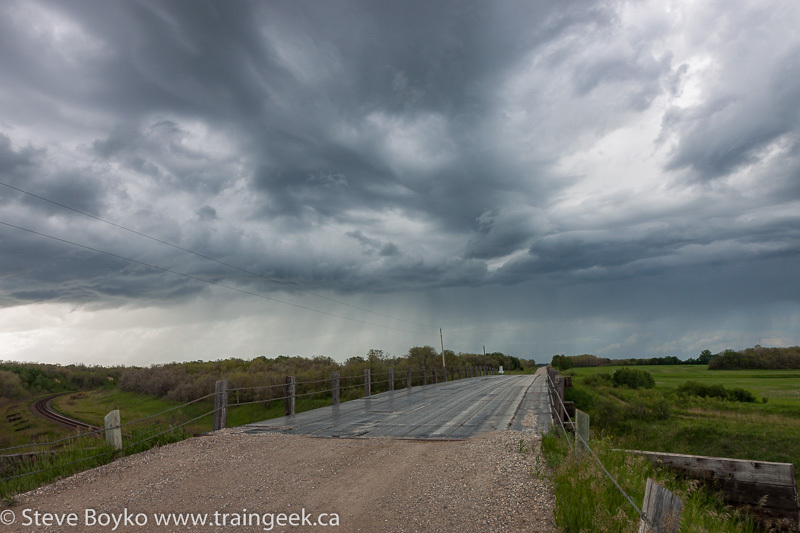 This road parallels the CN line a few kilometres to the north and I saw a train go by as I was rolling west. I arrived at Rivers and drove through town. 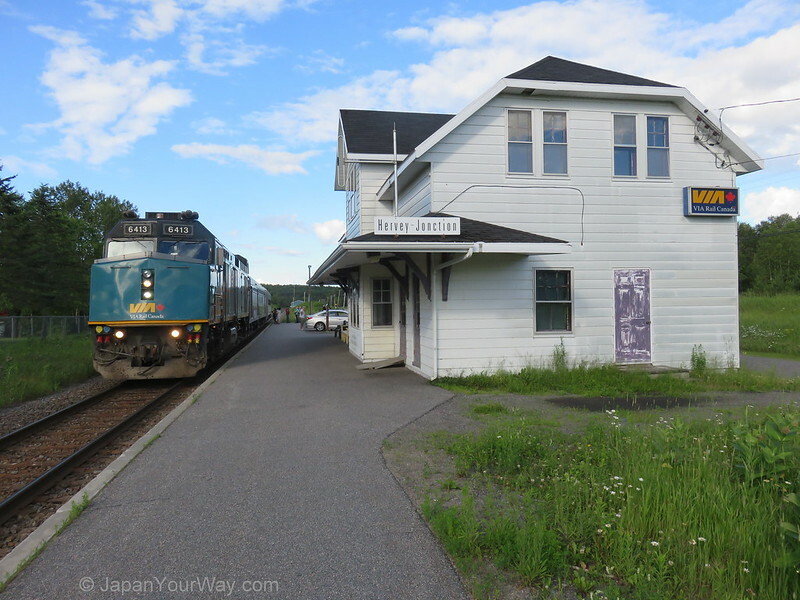 I noted a locomotive parked by the former station (more on that later) and I continued to the west end of town. 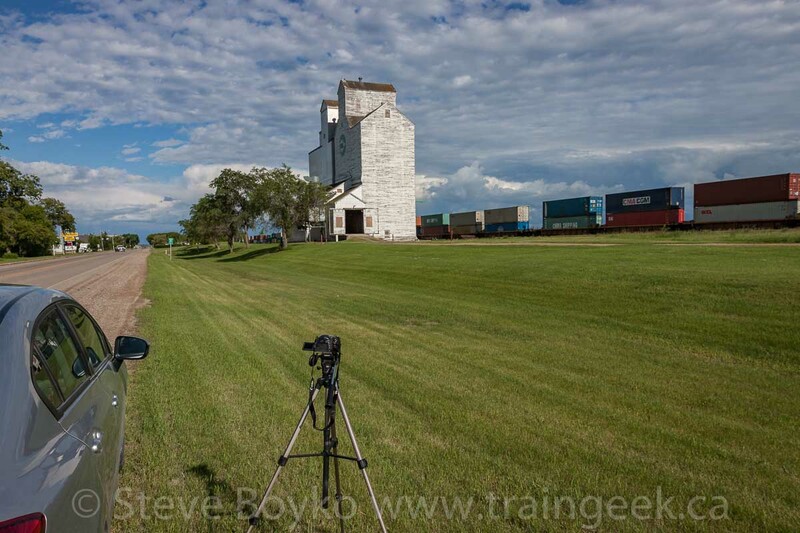 I saw an approaching container train in the distance, so I set up to photograph and video it by the former Cargill grain elevator(s). 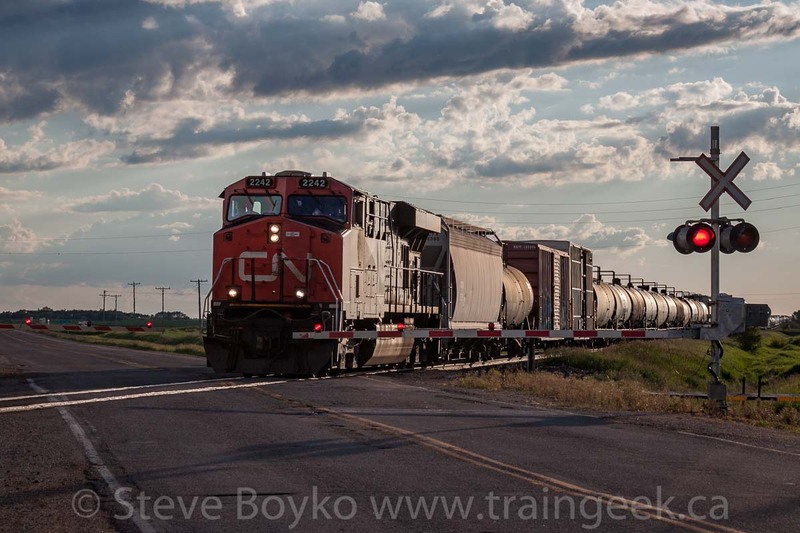 Soon, two of CN's finest, ET44ACs CN 3035 and 3048 rolled past the elevator. It was nice to see the elevator's doors open, indicating that it is still in use. In fact, later on I saw a grain truck drive up to the elevator. The skies were pretty interesting that night, as you'll see later. Here's the video of that train. 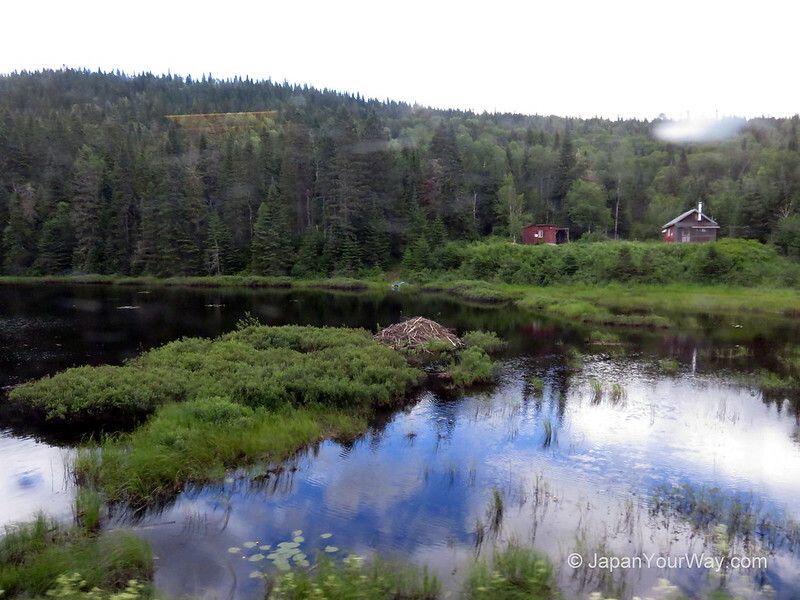 Once the train passed, I headed back into town. I stopped by the VIA station to check out CN 2438 idling away. 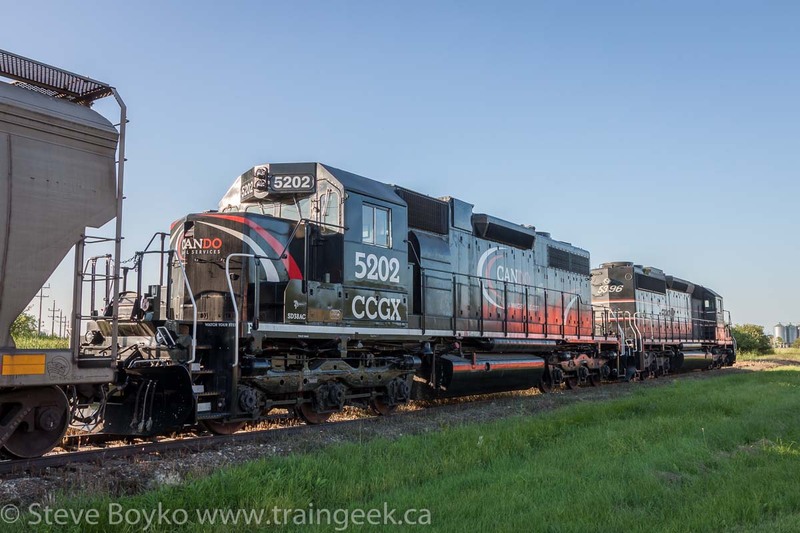 CN 2438 is one of CN's GE Dash 8-40CM (or C40-8M) units with the "Draper taper" behind the cab for greater crew visibility. Opinions are very mixed on whether the visibility is improved very much, and I don't think many crews like them. 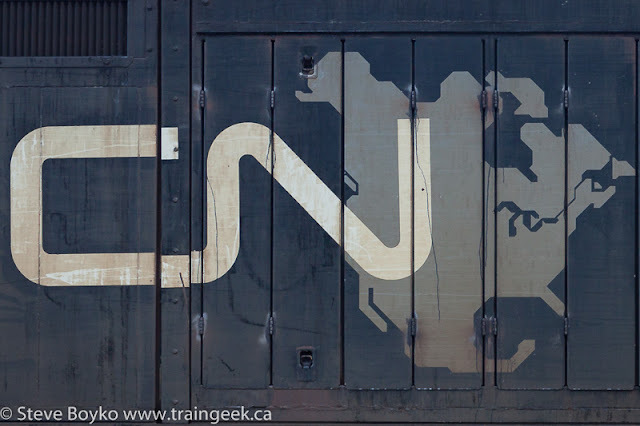 Many of the 55 CN units that were built have the "CN North America" logo on them. The location I wanted to shoot at is nicknamed "Grant's Cut". I don't know why. 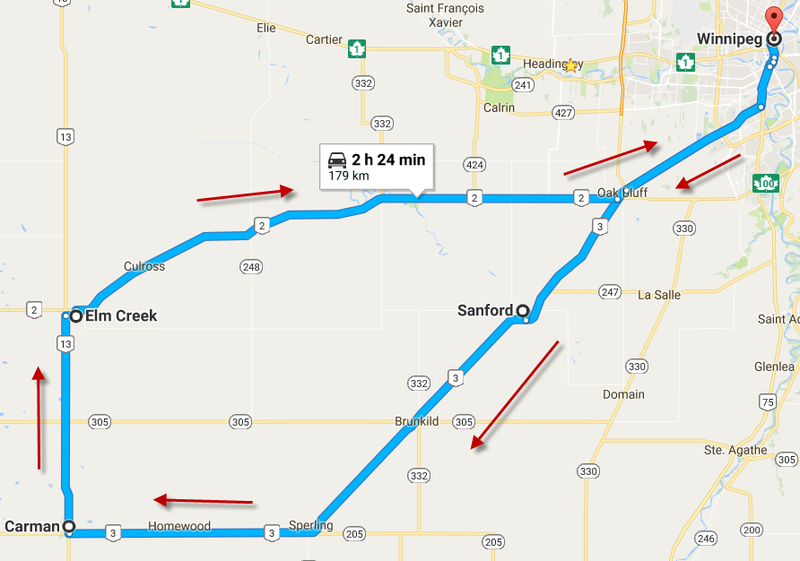 To get there, you drive east from Rivers on highway 25, then hang a right on Road 120W - basically the first right after crossing the Little Saskatchewan River. Drive straight through the 4-way intersection and keep going and you will cross over the CN Rivers subdivision. This is Grant's Cut (Google Maps). Note the skies! 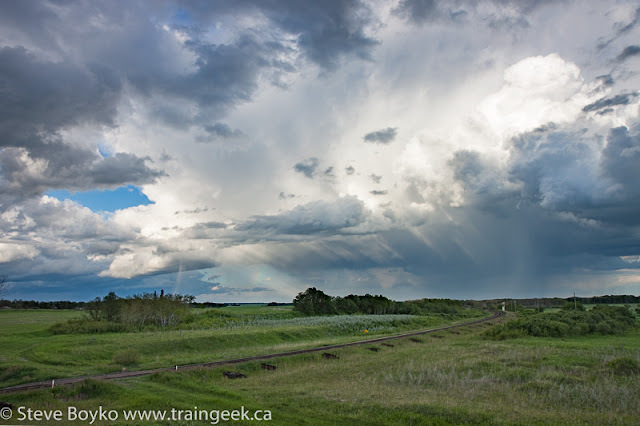 It was really threatening to rain by this time, and the clouds were moving swiftly. I parked off the bridge - it's really just one lane - and stayed relatively close to my car just in case it started to rain. Double rainbow! What does it mean? Rainbows were the theme of the night. The weather was very unsettled and there were some very dramatic clouds around. I was pretty concerned that I was going to be rained on - or hailed upon - but the nasty stuff passed by to the north. I did feel a few rain drops now and then. There was even some lightning in the distance. Wait... what's that in the distance? Red lights and a set of headlights? 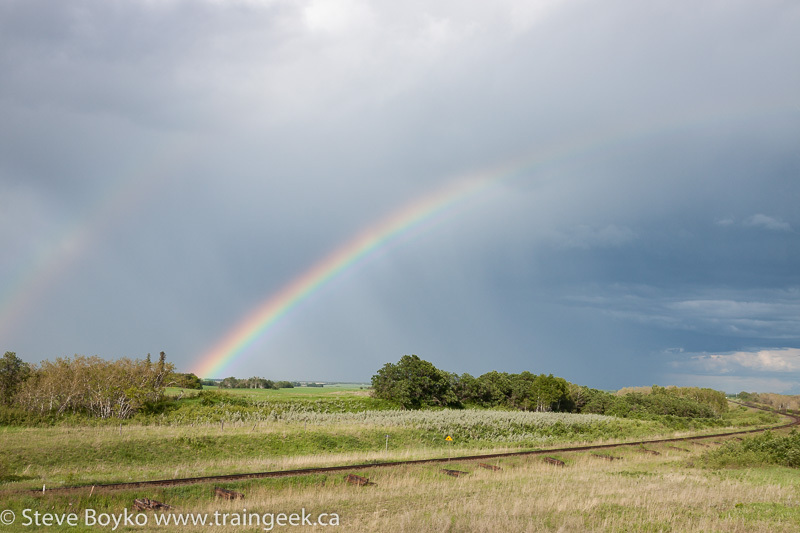 I was really hoping the rainbow(s) would stick around for the train's arrival. How cool would that be? 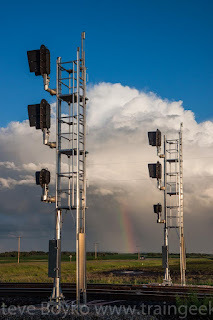 I've had some luck with rainbows and trains in the past. 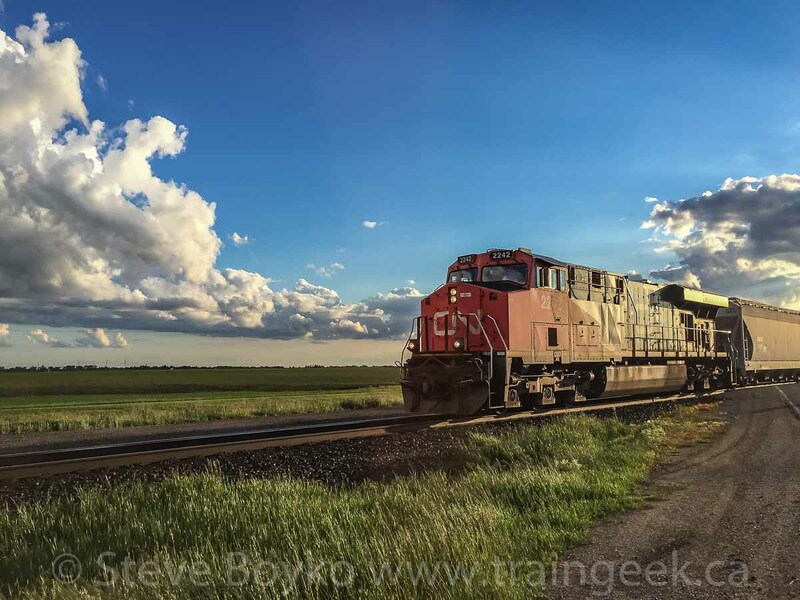 I just barely included a rainbow with a CP SD40-2 back in August 2014 and with a CP GP38/GP9 pair in Winnipeg. 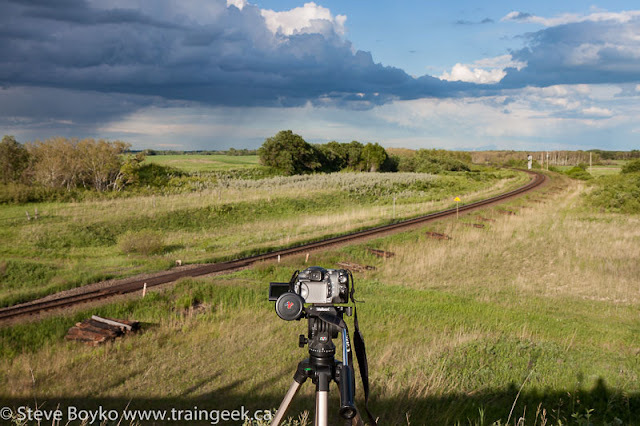 Back in 2010 I was railfanning in the Calgary area and caught a sunset rainbow at Keith. Alas, it didn't happen here. The rainbow was gone by 19:03 and the train didn't arrive until 19:06. So close! The sun was very spotty indeed. Notice the train rolling through the rural crossing and the "sucker hole" of sunlight here. This is a highly cropped view with my 70-200mm lens. The train was still a long way away. Here they are just about to take the curve... in the dark. A few seconds later, they've emerged into sunlight again and are taking the curve. 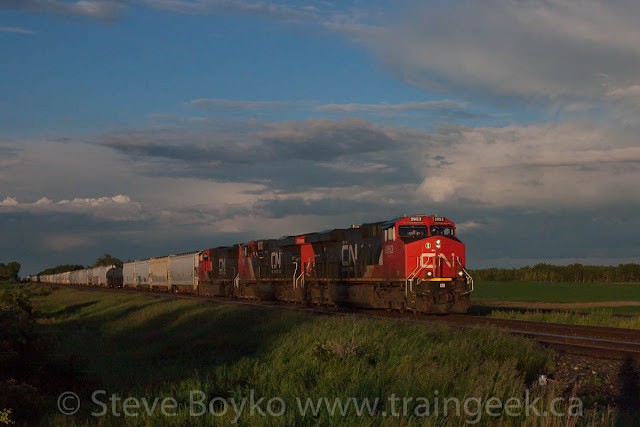 CN 2151 and BCOL 4641 were the power on this train. 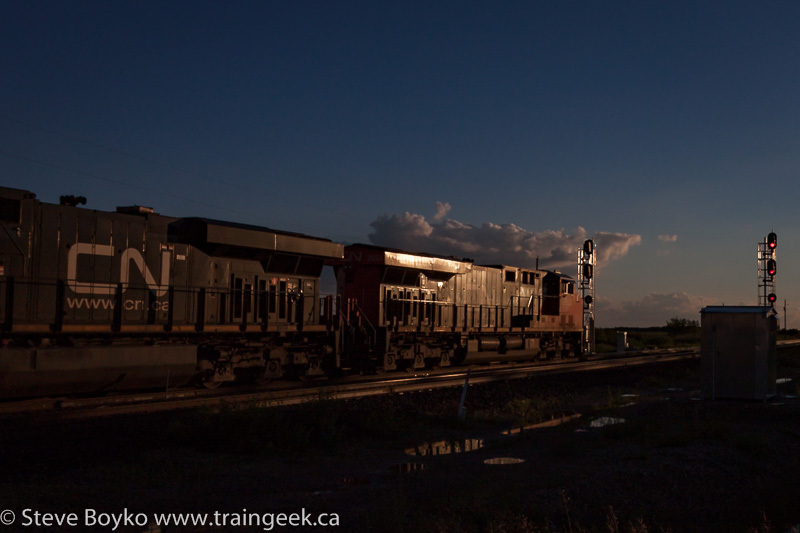 The profusion of empty centerbeam flat cars means this is CN 347... a train I have photographed many times. It is very distinctive. The weather was so strange that night. Here's a shot of them a few seconds later and it looks like a beautiful day! The train rolled on, endlessly, centerbeam after centerbeam after centerbeam. I counted from my video and I think there were 138 cars. I think these were all 73' cars so that's a 10,000' foot train. 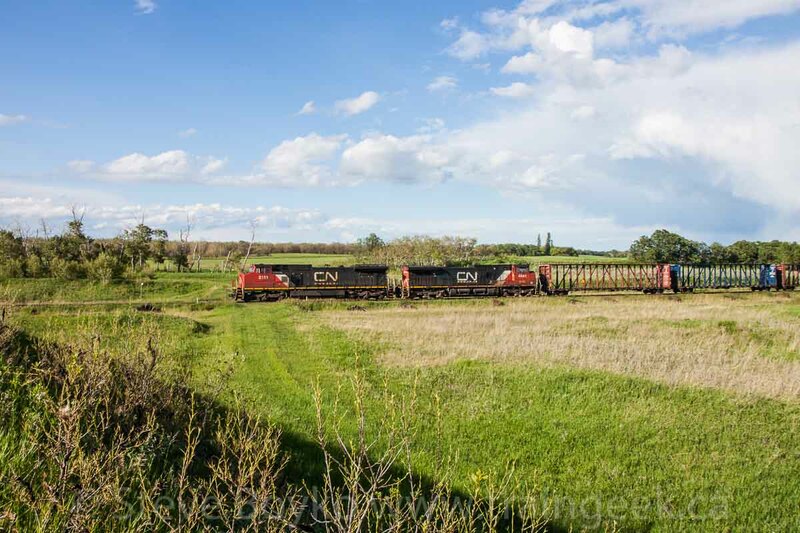 I've heard CN 347 called a "sail train" because of the appearance of the empty cars, and also because they have a sail effect and create a lot of wind at ground level for trackside crews who have to inspect the train as it passes. No CN crew has ever said anything nice about this train! As I said, the light was very variable and part of the time the train was in relative darkness. Challenging for photography and video! After that train passed, there was a lull for almost an hour. I was thinking about whether I should hang around or hit the road, but eventually the signal lit and that told me a train was en route. Or maybe I heard the engines before the signal lit. I can't remember which came first, but either way... TRAIN. I knew it was coming from the west, which is not great light for evening photography, but what can you do? Take pictures anyway, that's what! CN 2957 East was an oil train. 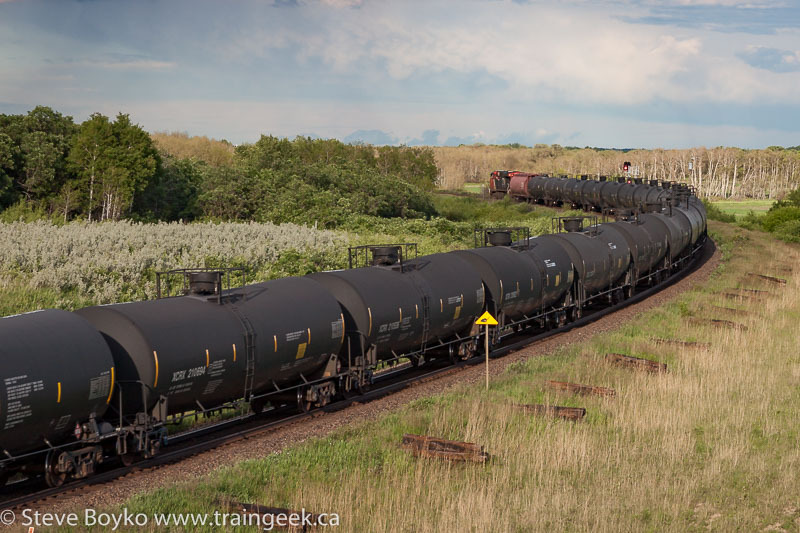 They had a single unit on the head end, a CN grain car as a buffer car, then a long black snake of oil tankers. 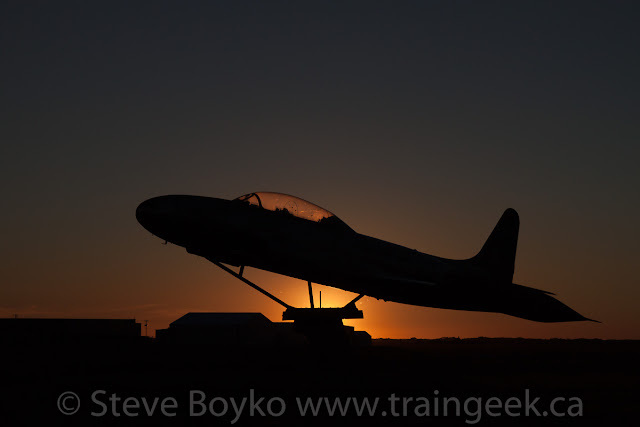 I think the above photo turned out pretty well for shooting somewhat toward the sun. It took a fair amount of processing in Lightroom but I like that side glint. The going away shot shows the dark and foreboding clouds and some rain on the horizon... plus a little shadow selfie. Dark clouds? What dark clouds? 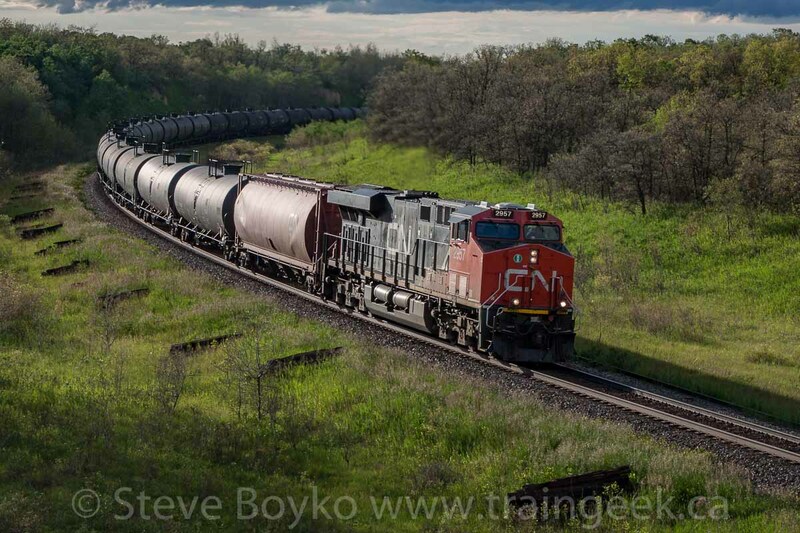 There was a tail end unit, CN 3041, with another buffer car between the locomotive and the tank cars. You can see it in the video I compiled. I hung around another 10 minutes or so but it was starting to get late (8:15 PM) and I wanted to check Rivers out one more time. The clouds were still pretty dramatic... and if you look closely, you'll see a wee little rainbow on the horizon just left of centre. Time for.. a crew change.. I drove back into and through Rivers. On the west side I saw there was a train pulling up to a stop... out of town. 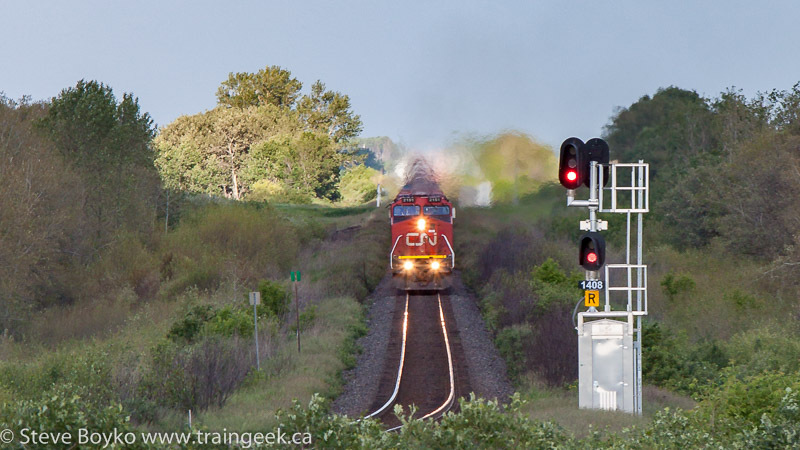 They were stopping at a rural crossing and there was a CN vehicle there. I suspect they were doing a crew change there to avoid blocking crossings within the town. CN 2242 was the sole power on the head end of this long freight train. It had a lot of autoracks. I was at the highway crossing on the edge of town. I decided to do something a little different and shoot with my "long lens" (70-200mm) to get a telephoto look, then use my iPhone to take a quick wide angle snap as the train passed. The problem with the telephoto / long shot was that there were a few shrubs (visible in the photo above) that prevented a nice full train shot, and then there was the crossing gate itself to get in the way. I'm not 100 percent happy with the shot below. It would have been a better composition had I stood closer to the tracks, but that's not safe and so I settled for this. I prefer the iPhone shot I took a few seconds later. 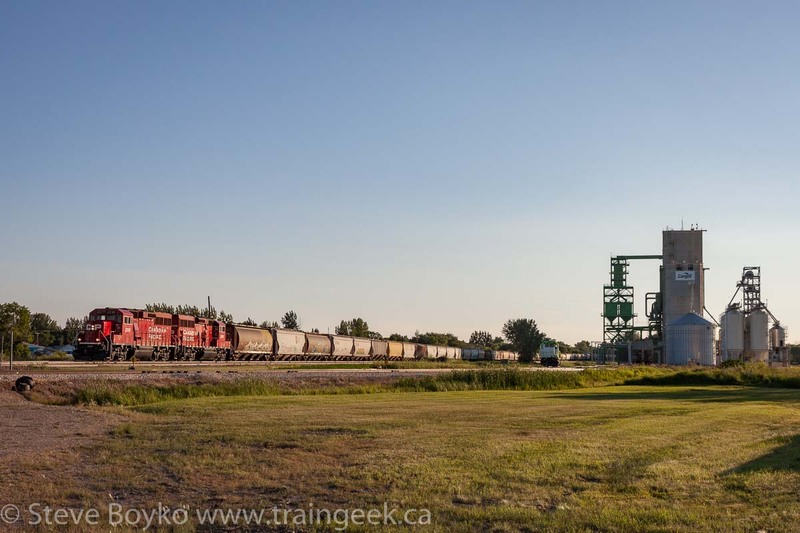 After that, I rushed over to the other end of town to shoot them passing the train station, with the grain elevator in the background. Imagine this shot in the morning... golden sunrise light on the nose of the locomotive, elevator and station lit... that would be nice. I had a notion to get them on the bridge just east of town.. before Grant's Cut. I knew I couldn't beat them there but maybe I could get a silhouette shot against the sunset. Worth a try! Yep, pretty much what I wanted. Jeannette Graves has a similar shot on Flickr. I drove back east along highway 25. Looking to the south I could see a container train slowly rolling west in the distance. 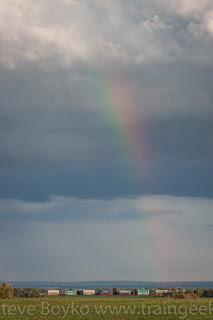 There was another rainbow. Of course. Rainbows were definitely the theme of the night. Did you know that "rainbow" comes from the Latin arcus pluvius, meaning "rainy arch"? In school everyone learns ROYGBIV, the seven colours decreed by Sir Isaac Newton. I always knew it was VIBGYOR - not sure why - but I think Roy G. Biv is a lot easier to say. Here there was no pot of gold at the end of the rainbow... just a container train. Nice enough for me. The photo to right was with my telephoto, cropped in. Check out the wide angle photo below. I couldn't stop taking photos of the sky! On my way to Rivers, I had noticed a major north-south road, highway 270. 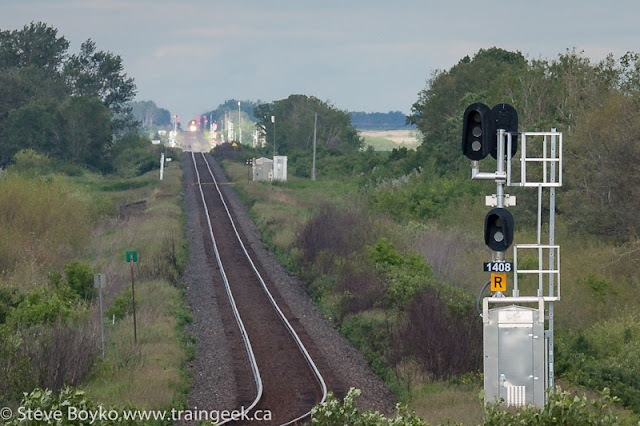 As I was returning east I decided to drop down 270 to the tracks and see what I could see. 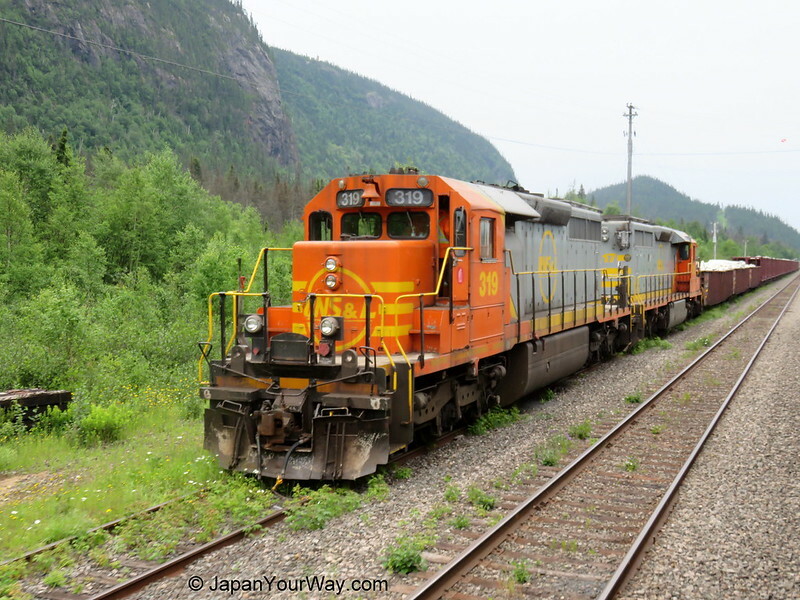 When I got there, I very quickly saw CN 2242 approaching from the west. I took a video of the train (see bottom of post) and then took a few photos of the area. 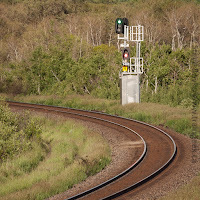 This is "Leap", a new control point / set of crossovers on the Rivers subdivision. 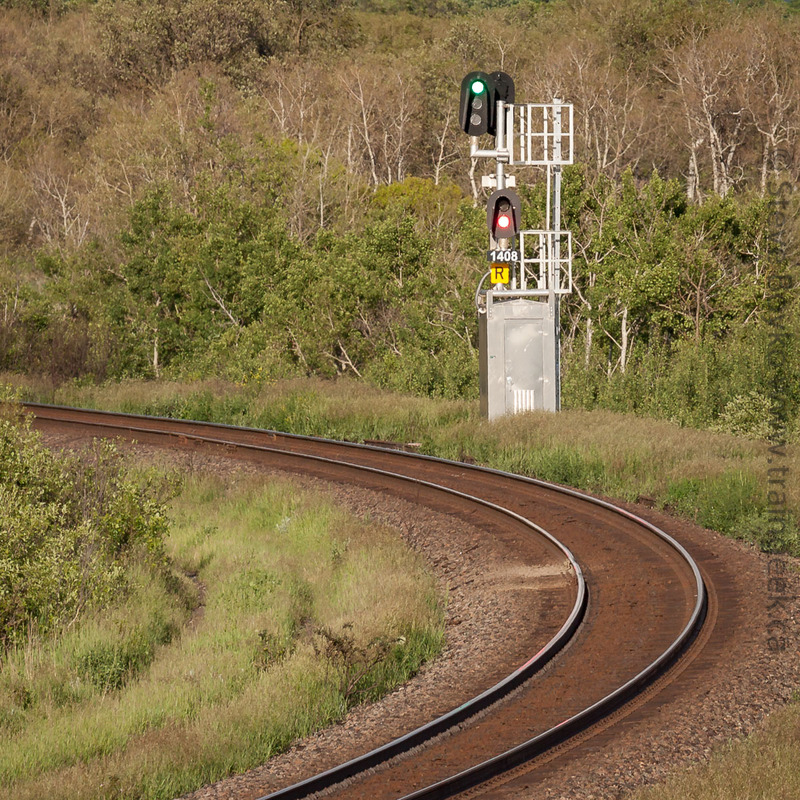 It has all new shiny LED signals. This is part of a 9 mile stretch of double track between Knox and Levine. There used to be a Manitoba Pool grain elevator here, at "Smart". It was demolished in 2002. 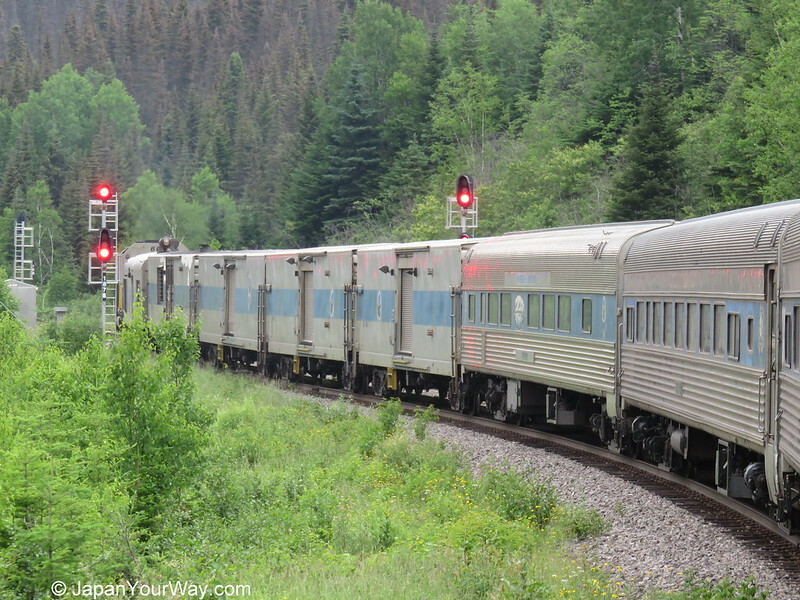 While admiring the signals, I was surprised by a westbound train. I was so surprised, in fact, that I didn't have time to adjust my settings and shot a full two stops too dark! Fortunately, I shoot RAW files so there is enough information in the file to recover a decent shot, despite underexposing the image so badly. I liked the going away "glint" shot. The train had CN 2953, 2969 and 5796 on the head end. 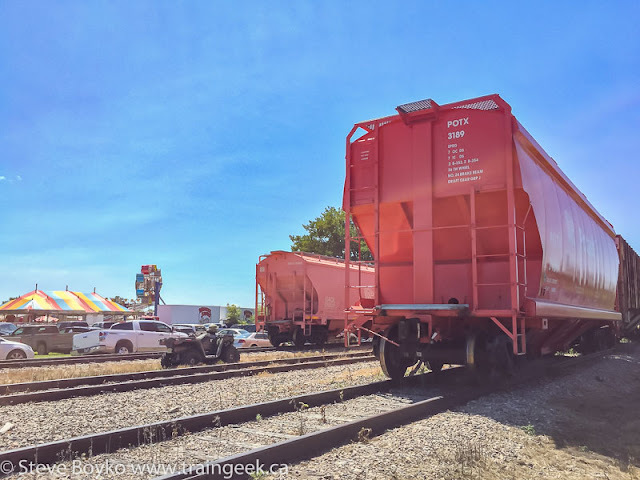 This post has been picture-heavy already, so I'm not going to post any photos of the cars, but I did want to mention that it had not one but two 2001 Census hopper cars (DCLX 7490 and DCLX 8096). It was getting pretty late by this point, so I went back up to highway 25 and then down highway 10 past Forrest. I couldn't resist stopping to take a few photos of the old Forrest grain elevator. I combined three photos into one to get enough of a dynamic range for the above photo. A little "HDR trickery" if you will. I was sure I was done taking photos by this time (9:36 PM), but as I passed the Brandon airport, the old T-Bird on display at the highway caught my eye. Then I was truly done for the night. Here's my video combining the two trains at Grant's Cut with CN 2242 at Leap. I hope you like it. I am trying a new video editing program, Hitfilm Express. So far I like it - and it's free! Good times and good photo opportunities. Thanks for reading. PS - hey, do me a favour and sign up for my mailing list! I'll send you a weekly summary of photos I post on social media (if you opt in to that) and occasionally I'll send you reminders of blog posts like these. That's it. Thanks! PPS - check out George Dutka's White River Division blog! He posts a great mix of model and 1:1 scale trains.. always worth a read. 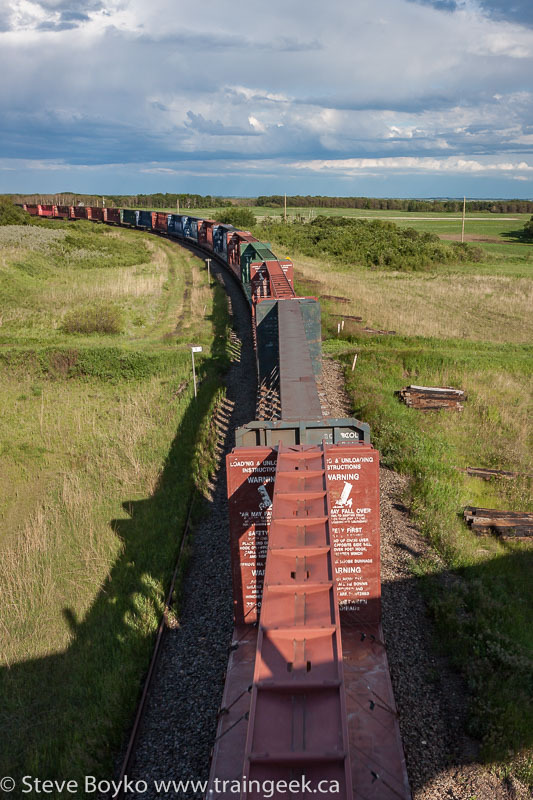 Omnitrax held a press briefing on Tuesday, July 18 to present the results of the study that they commissioned to assess the flood damage to the rail line from Gillam to Churchill, Manitoba. The costs are.. high. 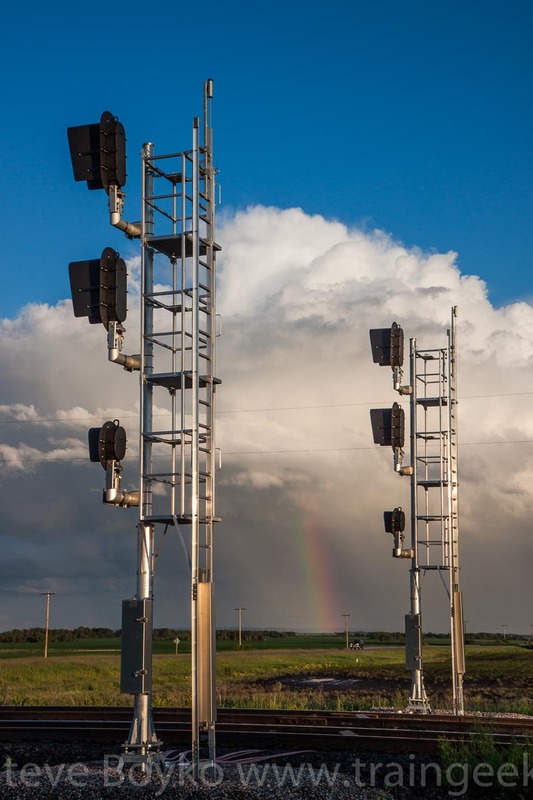 The study says there are 13 bridges, 68 culverts and 31 washout areas that need to be repaired on the Hudson Bay Railway's Herchmer Subdivision's 183.7 railway miles (294 km) between Gillam and Churchill. Omnitrax has stated that they don't have the money to fix it, and have called the line "a public utility" and they "believe there is a role for the public to play" in fixing the line. So far government response continues to be muted. The provincial government indicated it is looking to the federal government to lead. 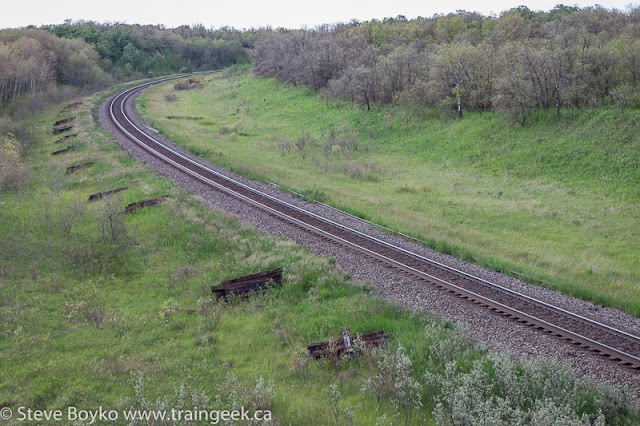 Meanwhile, the federal government indicates that Omnitrax has an obligation to repair the line. 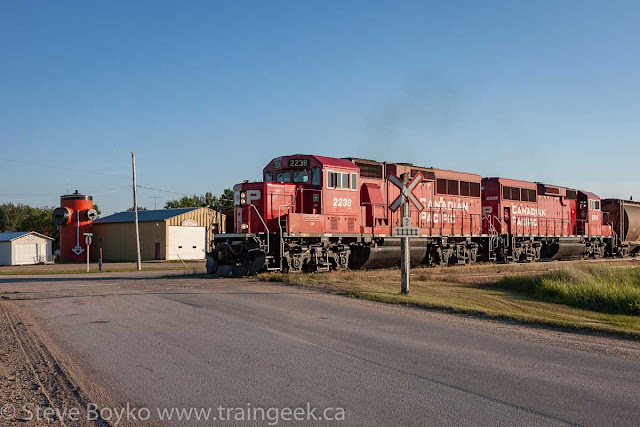 Reports say that Omnitrax has received $20 million from the federal government over the past 5 years and Manitoba has contributed "millions". AECOM said that Omnitrax has spent $60 million on the line since 2009 to improve conditions, although this Financial Post article seems to call that figure into question. Omnitrax stated that it has to have funding in place by August 1 to begin planning for the work to commence in September, and be completed within 60 days before it becomes too cold to work. There's no doubt that Omnitrax can't afford to fix the line. They are privately held, so their financials aren't available, but the estimate I found says the company's gross income is around $90-100 million USD. $60 million would be a tremendous burden. I assume they have some insurance to cover losses like this but nobody outside Omnitrax seems to know much about that. Many people are insisting that Omnitrax is holding the town of Churchill hostage for public funds. 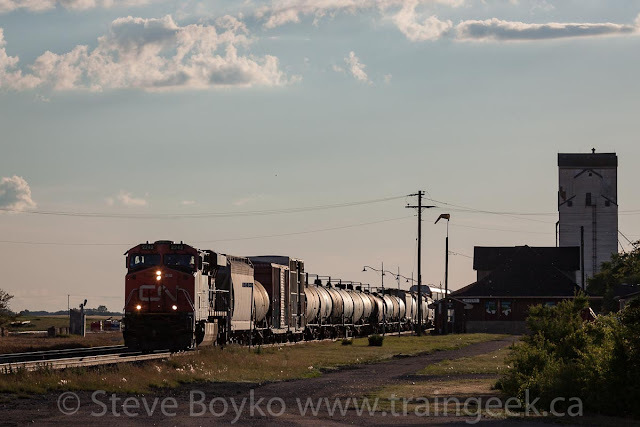 As I said at the end of my last update, I still think the best course of action is for Omnitrax to immediately proceed with the sale it already negotiated, and then the federal and provincial governments can step in to pay for the repairs. It's clear that the governments are loath to contribute money to a private company - understandably - so Omnitrax has to be removed from the situation. I can't see why Omnitrax would want to hold on to the line, except perhaps to get the best price for it. I have no doubt they are universally hated in Churchill, especially when they boosted the price of gas by 30 percent briefly last night. So sell it already and let's get on with fixing the rail line and restoring service. 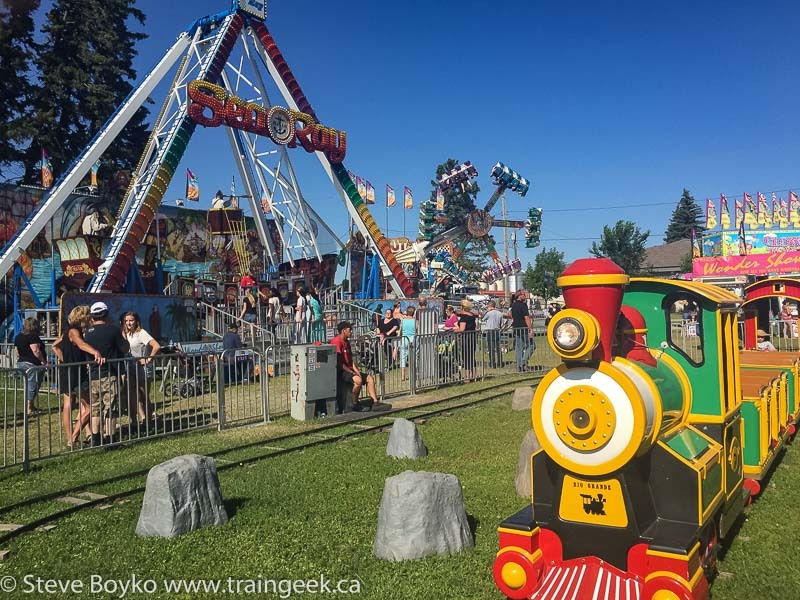 On Saturday July 15th our family traveled to Carman, Manitoba for the Carman County Fair. It was a lovely - if warm - day and we like going to these country fairs so the kids can ride on the midway rides without too much of a crowd. 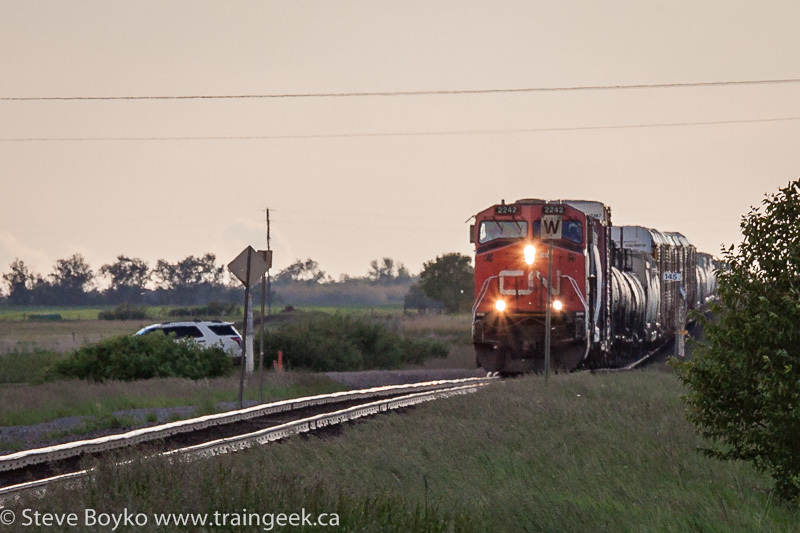 We drove down on highway 3, paralleling the Central Manitoba Railway (CEMR) Carman subdivision for most of the trip. 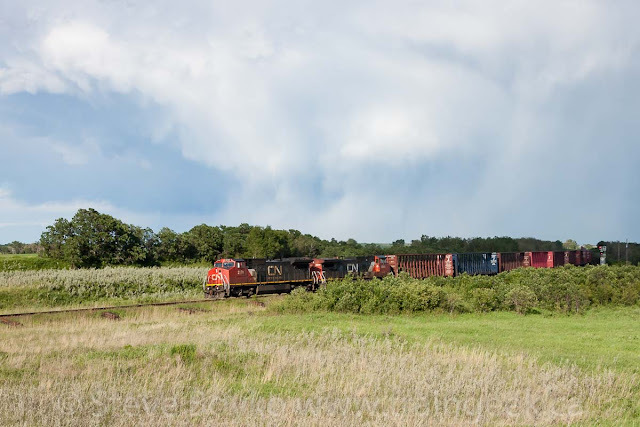 I noted cars at the Sanford grain elevator and some tank cars and a few ex Illinois Central ballast cars parked in Brunkild. 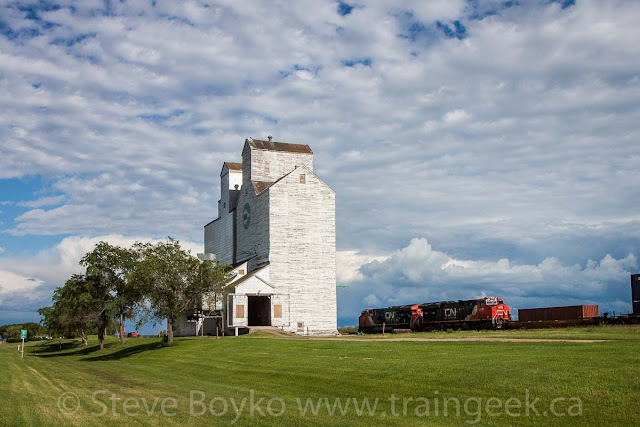 At the Pioneer grain elevator outside Brunkild, there were some maintenance machines and an ex Amtrak ballast hopper working on the elevator tracks. Carrying on down highway 3, the Sperling grain elevator was still gone (sigh) although there were tank cars stored in the village. The Homewood grain elevator is alive and well and the Carman warehouse had a lot of grain cars at it. 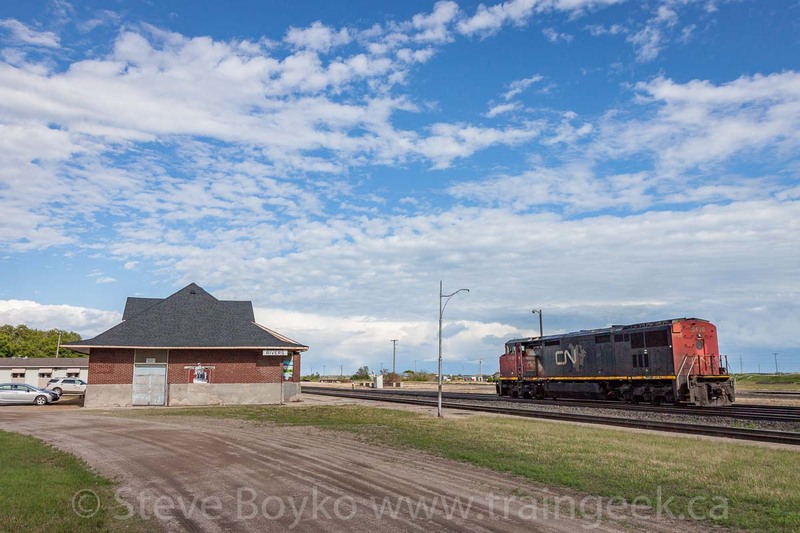 As we drove into Carman, I noted many potash cars stored in the town as well as a short CEMR train with two locomotives on it. I resolved to come back to that when we left. The fair was great - the kids had fun and my wife and I found the temperature and crowds quite tolerable. We ate supper there and the food prices were quite reasonable. 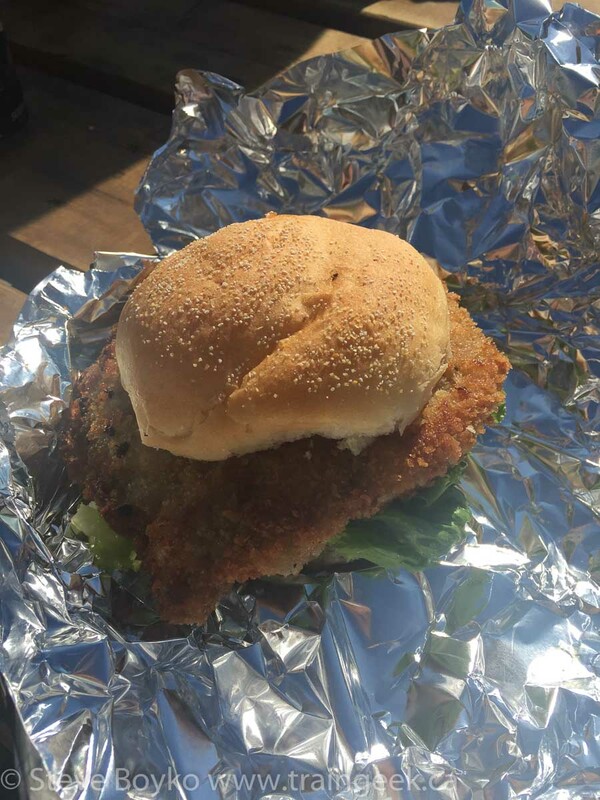 I saw one place advertising a schnitzel sandwich so I had to have that. 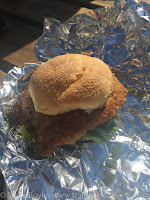 It was greasy but tasty! 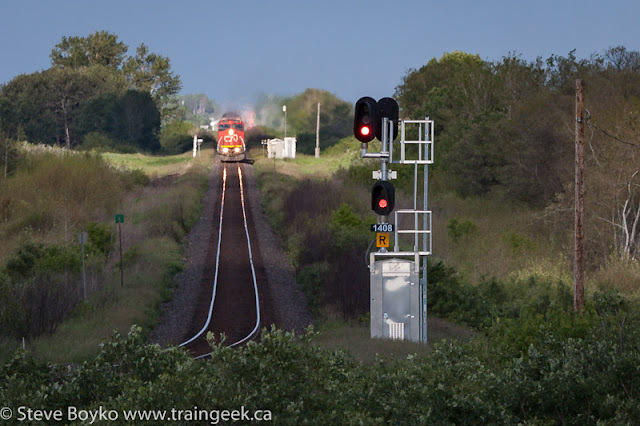 As you can see from the lead photo in this post, I couldn't help railfanning the toy train. After we visited the petting zoo - very popular with the kids - we had ice cream and then hit the road. I decided to head back through Elm Creek / highway 2 to cover a different route. On our way out, I stopped to photograph the CEMR train. It was not positioned for photography so I had to shoot a bit against the sun. Here's a photo I processed with HDR to get as much detail as I could. 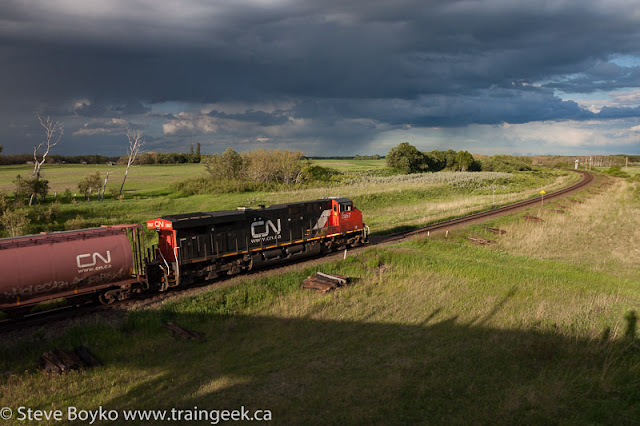 The far locomotive is CEMR 5396, an ex CP SD40-2 that I have photographed many times. The near one, though, is new to me. CCGX 5202 is an SD38AC originally built in 1971 for the Bessemer and Lake Erie Railroad as BLE 865. 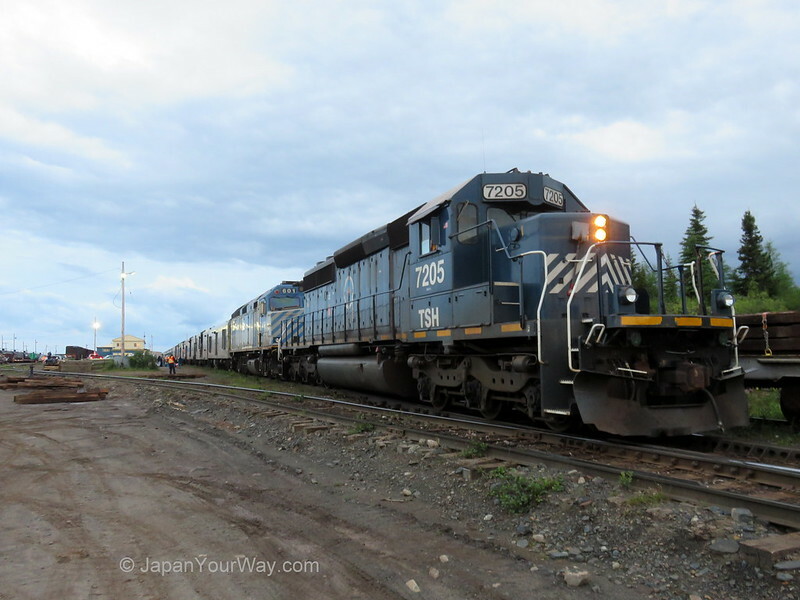 It was acquired by the Duluth, Missabe and Iron Range Railroad as DMIR 200 in early 1993 and retired in April 2008. It bounced around a couple of small companies and Cando Contracting acquired it in August 2015 (more info). This loco has been painted in Cando's sharp "swoosh" scheme and looks quite nice. Note the "SD38AC" designation, the plaque "Rebuilt with pride by CEMR Winnipeg", and the Buzz Lightyear sticker. That was nice to see. Hopefully I'll see it in better light soon. On the way up highway 13 to Elm Creek, I stopped briefly to photograph the two lovely grain elevators in Barnsley. They looked very nice in the setting sun's light. As we approached Elm Creek, I could see the highway was blocked in the distance.. by grain cars! It turned out that the CPR was in town. I drove through town and found the head end at the wye. 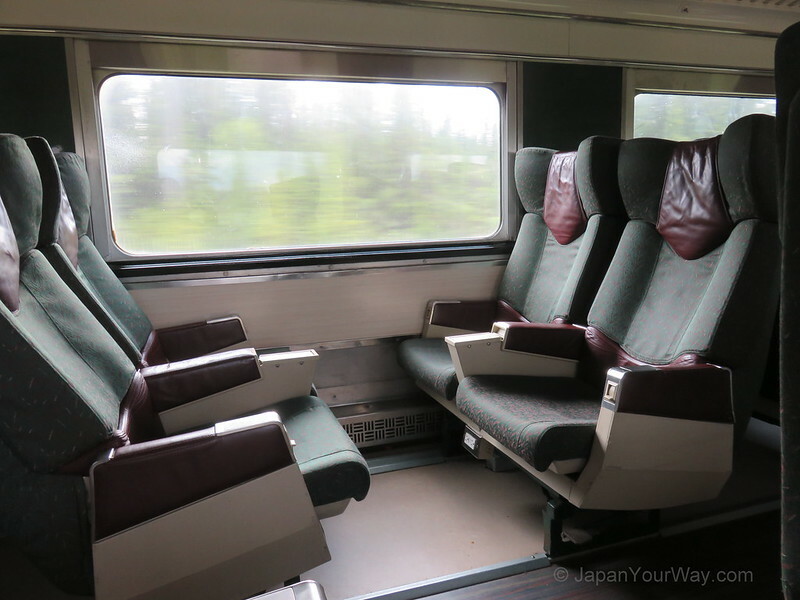 The train had two of the rebuilt "ECO" units on it, CP 2238 and 2325. Again the sun was in the "wrong" spot so I did the best I could. 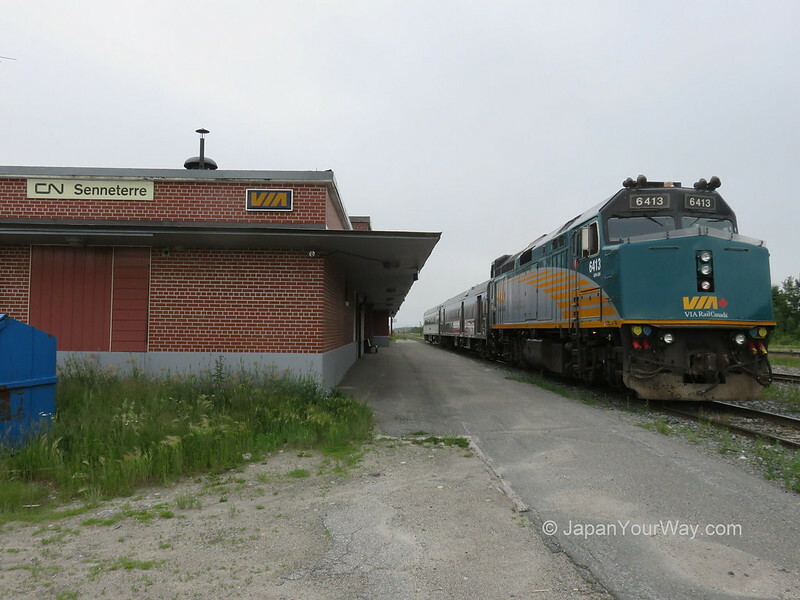 I saw the conductor walking back to the locomotives, so I drove over the nearby crossing to avoid being trapped on the "wrong" side of the train. The light was better on the other side.. If you squint you can see the Cargill unit about 2/3 of the way across the photo, near their grain elevator. They started pulling, so I grabbed a photo I had been planning for a long time... the train by the giant fire hydrant. That hydrant is apparently the second largest in the world. 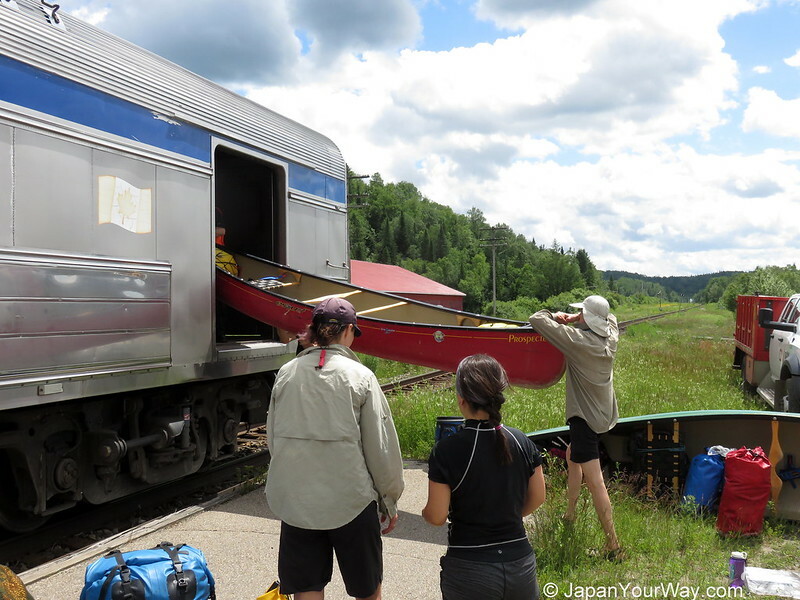 We headed home without waiting for the train, as it was getting late and I didn't want to push my luck with my family. We passed the lovely elevator in Culross - no cars - then Fannystelle - no cars - then Starbuck - cars - then back onto the Trans-Canada Highway and home.